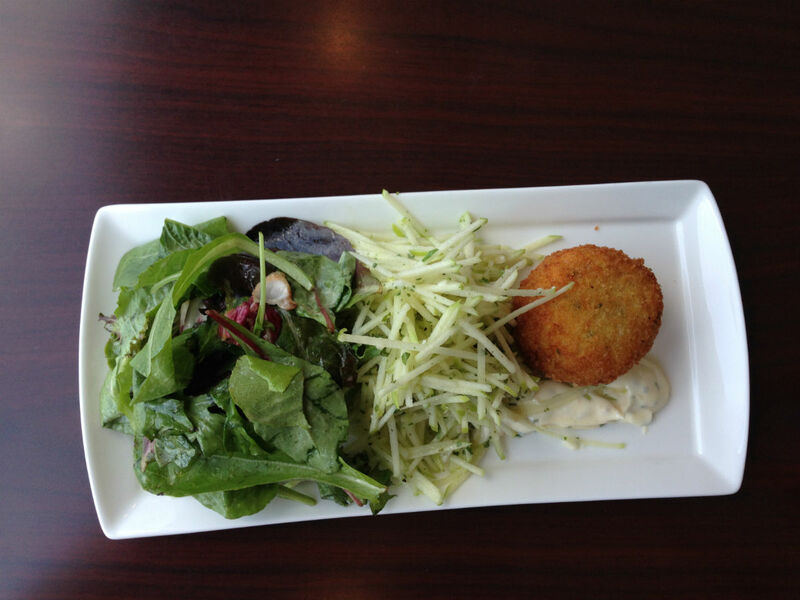 a delicate spinach salad beside a perfected mozza ball. One of my favourite neighbourhood restaurants from Vancouver has come to Winnipeg -- Charleswood to be precise -- and I am kind of freaking out about it. Well, it sort of has. To clarify, the original was called CRAVE, and was only a couple blocks down from our Main Street apartment, where my wife and I lived for six years. We'd eat there at least once every two weeks, devouring ridiculously well-executed comfort food like a Buttermilk Fried Chicken Cobb Salad that was near moan-inducing, a Short Rib Rigatoni that was the ideal respite from the Vancouver rain, and a Dungeness Crab Cake (served alongside a matchstick apple salad) that is so good you'd consider resorting to violence if your dining companion tried to take a piece of it (I may still have a fork mark in my hand after trying to get the last bite of my wife's). The people behind it were Chef Wayne Martin and Manager Greg Gunnarson, who along with CRAVE also open up two other highly regarded and successful spots, Fraiche and CRAVE Beachside, both in West Vancouver. But now, after years in Rain City, Martin and Gunnarson have brought the concept behind CRAVE, including the majority of the menu, to the eastern end of Charleswood, resulting in the charming new Capital Grill & Bar. "I started my career with the Four Seasons at Minaki Lodge.... and Winnipeg was where we would come do all our shopping and partying," said Chef Martin. "I just had good memories of it [Winnipeg] and I was tired of Vancouver -- it had got so overpriced, overcrowded, and bad traffic." It's a sentiment you do hear quite a bit about when people leave Van these days (I've personally been interviewed about it in the Vancouver Metro), but that being said, I still had to ask Martin and Gunnarson, why Winnipeg? "Why not? It's beautiful here," replied Martin. "Plus there is more history here, and more culture, a lot more culture." Gunnarson's family is here too, as he was born and grew up on Clear Lake. As he put it, "we just reconnected with friends and family. We knew we wanted to relocate and Winnipeg just made more sense compared to say Toronto or Calgary where we have no ties." Since moving, they've renovated the space that once housed Asahi, creating a stylish room accented in blues and greys featuring fresh herb centrepieces. It's comfortable and well put together, just like the food, wine and beer menu. The location itself is pretty close to everything, just down the road from Assiniboine Park, and under five minutes drive from the River Heights, Corydon and Tuxedo neighbourhoods. It stealthily opened on May 5 -- "we wanted to open quietly," said Martin, "to get our feet wet and see what is popular on the menu and what is not," -- but has since found a following strictly through word-of-mouth. The most popular item so far has been the Beer Battered Halibut and Chips ($18), which they've done over 550 orders of, along with the Chipotle BBQ Baby Back Ribs ($22) and the Capital Burger ($15), which is topped with crispy pancetta, caramelized onions and truffle cheese. From my experience of eating Martin's food so frequently for so many years I will tell you this: the man has a deft hand at braising and his fries are almost out of control (the perfect size, with a crisp exterior that snaps while still having that fluffy potato centre). Along with the aforementioned crab cake -- which is a must, Martin was stoked he could still use his same seafood supplier here and thus all his fish is as it was out west -- we always ordered the Short Rib Poutine ($12), whose parmesan truffle fries are sauced with a short rib jus I'd consider bathing with, along with the Shorty Rigatoni ($16) that is going to be exactly what you'll want on a winter's day, perhaps after a ski next door in Assiniboine Park. I've always been a sucker for his pulled pork too, which is ludicrously tender, slathered in a delectable barbecue sauce and served on a focaccia that is sprinkled throughout with flakes of sea salt and rosemary. Eating at Capital was like catching up with an old friend, which of course it would be, as CRAVE was always one of the spots we'd bring friends when they were visiting us in Vancouver. I'm sure shortly, as was their case in Vancity, reservations will be a necessity to see this old friend again; Capital's food is too good not to develop a devout clientele.